Zambian dictator Michael Sata has bowed to international pressure and his brutal police have been forced to reduce UPND president Hakainde Hichilema’s charge and other UPND leaders from murder to merely proposing violence. 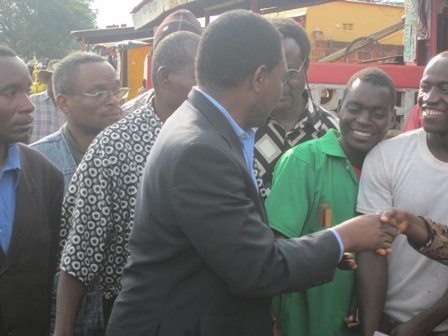 Hichilema and all officials arrested with him are still in detention. And UPND Choma MP Cornelius Mweetwa says the detention of all top leaders who have gone to Livingstone looks like a ploy to undermine the party’s ability to monitor elections tomorrow. He however hoped that Hichilema will be taken to court this morning so that lawyers can apply for bail since the offence he has been slapped with is both bondable and bailable but wondered why police could not give him bond yesterday. PF police Southern province police Commissioner, Charity Katanga disclosed that Mr. Hichilema’s charge will now be that of proposing violence contrary to section 91(1) of chapter 87 of the laws of Zambia. The charge falls short of what security sources said Mr. Sata initially wanted which is murder that carries a death penalty in the Zambian legal statutes. Security sources said there was too much pressure on the Zambian government from diplomatic and international community on the Zambia police and president Sata to immediately release the UPND leaders in order to reduce the heightened tension in the Southern African country that is already under spotlight over increased human rights abuses. The arrest of the UPND president and other leaders has so far been widely covered by a number of international media houses that have labelled the whole issue as continued victimisation of opposition figures in Zambia. Even before concluding investigations, Sata’s drunken Home Affairs Minister Edgar Lungu, in company of Inspector General of Police Stella Libongani, earlier told the state media, Zambia National Broadcasting Corporation (ZNBC) that Mr. Hichilema was personally responsible for the death of the PF cadre who was transported by the ruling party to Livingstone to cause violence. PF cadre, Harrison Chanda, who resides in Monze and Lusaka died after him and his fellow drunk thugs attempted to invade and burn down the UPND campaign camp in the up-coming Livingstone by-elections. Riots immediately broke-out in Zambia’s tourism capital forcing tourists and residents to lock themselves in their homes. Livingstone residents late on Tuesday were forced to stock-pile their home supplies as shops were forced to close prematurely with others lining up at filing stations to fill-up their vehicles in anticipation of further trouble. Tourists found in the city were forced to make early flight bookings back to their countries as police patrolled the city center and fired teargas to disperse the rioting crowds that were demanding release of their leaders. By late night, other UPND supporters were on their way to Livingstone to offer solidarity to their detained leaders. And UPND Choma MP Cornelius Mweetwa says the detention of all top leaders who have gone to Livingstone looks like a ploy to undermine the party’s ability to monitor elections tomorrow. Mweetwa said so far 26 UPND officials are in detention and wondered how such a big number of people can sit and conspire to kill a person. Mweetwa accused Home Affairs minister Edgar Lungu of acting as the arresting officer and court on the arrest of Hichilema. Mweetwa said the statement by Lungu makes it impossible for the police to do a professional job as the executive has by that statement told the police to restrict their investigations on Hichilema. Mweetwa reminded the PF that the authority they are using is ‘rented power ‘and that time will come when it shall be withdrawn. He said it’s a pity that people are just being arrested on account of being UPND members. On the campaigns in Livingstone, Mweetwa said his party is in touch with voters despite what has happened. He hoped that the situation will normalise a bit today so that his party can also do final touches. He said for now his party is keeping the flame burning through social media and encouraging voters. He appealed to voters to turn out in large numbers tomorrow and vote for UPND nd not be intimidated by the huge presence of the police. Zambia’s Livingstone city is scheduled to co-host the United Nations World Tourism Organisation Conference later this year along side Zimbabwe. Since coming to power, Mr. Sata has openly supported the Zimbabwean leader, Robbert Mugabe’s policies, who is so far the only foreign head of state to have visited him. Sata’s PF regime has also openly supported Chinese and Cuban policies against other Western nations.